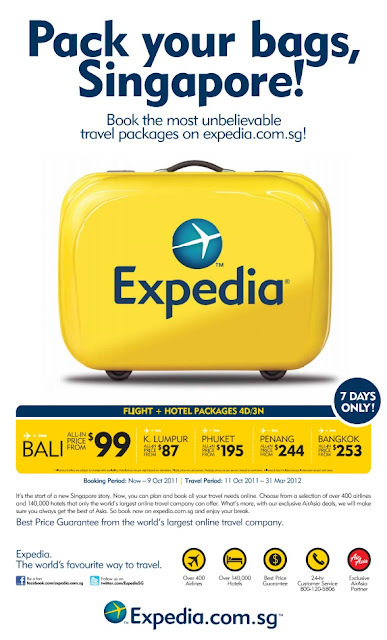 Expedia Singapore has relaunched with sizzling hot deals! Prices have been stripped down to the bare minimum! Can you guess how much a 4D3N flight and hotel package deal to Bali is? Smiling broadly in the background are (left) Dan Lynn, CEO of AirAsiaExpedia, and (right) Scott Durchslag, President of Expedia Worldwide who today kicked off the launch of the new full service site (it's a joint venture between Expedia Inc, and Air Asia). They know you will not believe the price. It's an amazing S$99! Witness the jubilation all round! That's not all. For one week starting today, they are offering specials to four other destinations as well. Flight and hotel 4D3N package to Kuala Lumpur for just S$87? Phuket, Penang and Bangkok too are on the specials list. Booking starts from 3 to 9 Oct 2011, and is valid for travel between 11 Oct 2011 and 31 March 2012. That's a pretty decent window. I hear there'll be new deals rolled out each week, so this isn't just a one-time phenomena. They designed the new Expedia.com.sg to be really easy to use. You'll have a choice of over 140,000 hotels and 400 airlines, along with a Best Price Guarantee. If you find a similar deal cheaper elsewhere, Expedia will match that, and give you a S$50 for future bookings. I've been booking flights and accommodation online for more than a decade (such as my Japan 2007 trip), but usually with the airlines and hotels directly. I've never used Expedia before, usually because I wasn't sure the best deals were there. But now with the Best Price Guarantee, it's worth a look. Well, how do you beat that? All-in 4D3N Bali for S$99. It's not a dream. Now I just want Air Asia to fly to Hokkaido and Jamaica! Like Expedia.com.sg on Facebook page to keep track of more deals coming your way. Okay, so those are mindblowingly amazing deals. But why all the scantily clad people? bleh. Letti: because prices have been stripped down to the bare minimum. I didn't show the photo of the models stripping. It's here on my Flickr.